For general applications for grinding and material removal and ideal for smooth shaping and finishing of concrete, stone, and masonry surfaces. 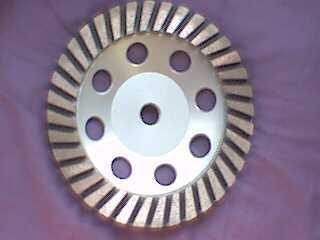 For faster removal, grinding, rough deburring, finishing of concrete, stone, and masonry surfaces. For heavier material removal and for steep slopes and ideal for smooth shaping and finishing of concrete, stone, and masonry surfaces. 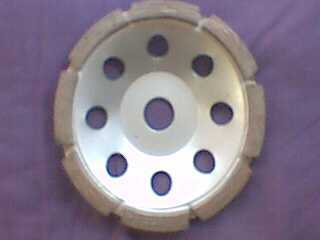 4, 5, 6, 7 inches with segment at 20mm width & 5.0mm height. 4, 5, 7 inches with segment at 5.0mm width & 8.0mm height. 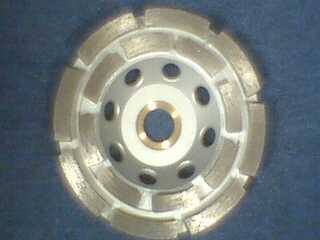 4, 5, 7 inches with segment at 5.0mm width & 8.0mm height. 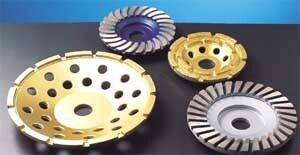 Featuring highly abrasive resistant and good for quick, smooth and free grinding at wet or dry. Arbor hole size per order and 7/8" ~ 5/8" or M14 threaded are available.